Natural gas has been foisted on the American public as a “clean” source of energy, but in fact, it’s a dirty fossil fuel, with harmful impacts from drilling, pipeline construction and combustion, and with dire implications for the climate. Appalachian Voices is working across the board to block billions of dollars of new gas infrastructure in our region, and are calling instead for major investments in truly clean, environmentally just energy sources. Hydraulic fracturing, or “fracking,” involves drilling deep underground and injecting vast amounts of water mixed with sand and a brew of chemicals to fracture the shale formations and release the gas. Engineering advances in the last decade have also enabled the industry to angle the deep wells and drill horizontally, sometimes for miles, making previously inaccessible gas deposits profitable. In 2005, Congress passed the Energy Policy Act, which contains a provision — often called the “Halliburton loophole” — that exempts the gas industry from certain requirements of the Safe Drinking Water Act, the Clean Air Act, and the Clean Water Act, including having to disclose the dozens of chemicals it uses. The result? The industry has grown substantially, including in the Marcellus and Utica shale regions of West Virginia, Pennsylvania, Ohio and New York. Minimal federal oversight and inadequate state regulation have fueled the trend, but recent actions prove another future is possible. In 2014, Governor Cuomo announced an historic ban on fracking in New York — the only state to do so — while counties across the country are passing moratoriums, including in North Carolina. Increasingly, studies show that fracking operations have contaminated or depleted underground sources of drinking water, caused air pollution and triggered earthquakes. There’s a strong correlation between fracking sites and deteriorating health among nearby residents. And property values in many communities near fracking sites are taking a hit. The above video, “Living Next to a Natural Gas Well: Part 1,” was part of a news story by WDTV reporter, Zach Maskell during the height of a fracking operation near Leanne Kiner’s home in Harrison County, W.Va. While burning gas for electricity has lower smokestack emissions of carbon dioxide than burning coal, the total climate impacts are significant. Both the drilling and transportation of gas results in “fugitive emissions” of methane, a greenhouse gas that is 84 times more potent than carbon dioxide in the short term. A recent report notes that completing just the 19 gas pipelines proposed (as of summer 2016) in the East will cause the U.S. to miss its climate-pollution reduction goals under the historic Paris accord. Other experts say we can’t afford to continue the massive expansion of gas production at the current rate if we hope to keep climate change in check. But the fracked gas industry is going full tilt. In West Virginia, more than 16,000 acres of land have been damaged by more than 3,000 wells since 2005. 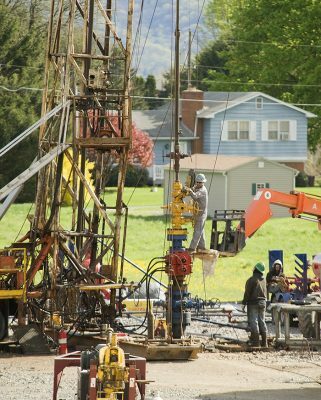 In Pennsylvania, where almost 8,000 wells have been drilled, the impact is even more drastic, and the industry continues trying to expand its operations into new areas. In Virginia, fracking has occurred in the far southwestern part of the state for some time, but now companies are scoping out other sites. A 2010 proposal to drill in the George Washington National Forest was defeated due in large measure to citizen outcry, and the U.S. Forest Service subsequently put a moratorium on oil and gas drilling on almost all of the forest. The industry is also eyeing the Taylorsville shale basin near Richmond. The state is currently reviewing its oil and gas regulations and considering measures that could allow for more fracking in the future. In 2014, North Carolina lifted its long-standing moratorium on fracking at the industry’s urging, paving the way for the first-ever gas drilling there. However, several localities have responded by passing moratoriums. As part of the rush to frack the Marcellus and Utica shale basins, 19 new pipeline projects have been proposed to carry the gas to markets all across the East Coast and overseas. Several are proposed in our region, including the 600-mile Atlantic Coast Pipeline and 300-mile Mountain Valley Pipeline, which would impact countless family farms, rural communities, historic sites, and natural resources on both public and private land in West Virginia, Virginia and North Carolina. Further, the projects would hasten the pace of fracking and intensify the harmful impacts in those communities. The greenhouse gas pollution from just these two pipelines would produce as much as 45 coal-fired power plants — some 158 million metric tons a year. Each of these two interstate projects needs a permit from the Federal Energy Regulatory Commission (FERC). Appalachian Voices, along with dozens of other local and regional groups, local governments and elected officials are calling on the agency to conduct a combined, comprehensive review of all the projects to ascertain the full scope of impacts. The agency has so far refused, despite evidence that the gas industry is over-building infrastructure. The cost of just the Atlantic Coast and Mountain Valley pipelines would run roughly $9 billion — not including the public resources paid for by taxpayer dollars needed to accommodate the industrial growth — locking us into a half-century or more of burning fossil fuels. That’s money that won’t be invested in truly clean, 100% renewable energy sources. Across America, businesses, local governments and others are making impressive progress in shifting to clean energy sources like energy efficiency, solar and wind. Not only do these energy solutions translate to cleaner air and water and safer communities, they create new local jobs and tremendous economic opportunities. The solar industry is growing 43% a year, due largely to cost-competitiveness of the technology. That growth includes 1 million residential rooftop installations. As of 2015, the solar industry employed 208,859 people, more than twice as many as the coal industry. Similarly, the wind industry is growing by leaps and bounds, with nearly 50,000 turbines now installed — enough capacity to power 20 million homes. Jobs in the wind industry are one of the fastest growing now; the Department of Energy projects 380,000 jobs by 2030. In a 2016 report, McKinsey & Company estimated that a $520 billion investment in energy efficiency could save the economy more than $1.2 trillion and potentially reduce America’s annual greenhouse gas emissions by 1.1 gigatons — the equivalent of taking the entire U.S. fleet of passenger vehicles and light trucks off the roads. But that same report shows that all five Central Appalachian states ranked in the bottom third for home-energy efficiency: Tennessee is ranked 45th, West Virginia is 42nd, Kentucky is 38th, North Carolina is 37th, and Virginia ranks 36th. We are working in solidarity with the many county-based and community organizations that have formed along the pipeline routes to defend their farms and homes in North Carolina, Virginia and West Virginia. And we’re collaborating with many partner organizations to defeat these projects at every opportunity at every level. 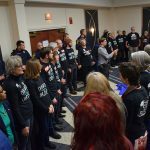 In addition, Appalachian Voices is connecting with groups and citizens elsewhere in the country who are fighting other natural gas pipelines with an eye toward demanding greater oversight of FERC.